We visited Church #4 again this morning for the early service, our third visit to this one. At the health store I regularly shop, I met one of the members that hugged me on our first visit at the church. It was then that she connected the dots for me mentioning that we have ran into each other many times through the years. Our first meeting was at a homeschool day at the farm where I get my raw milk some eight or nine years ago. She had only one daughter then and my Princess hit it off with her right away although her daughter was a bit shy. I cannot believe I did not recognize this lovely lady at the church, but she remembered me. She is in one of the two praise and worship teams. Her husband is the choir director also. While the pastor was beginning his sermon, my Lord was speaking to me about something related but not the focus of the message being given. The message was based on Joshua 4:15-24 about the twelve stones and them being a foundation on which to build on faith and do greater things than the ones who laid the foundation. Then he mentioned several men and women in the Bible saying that we think they are great yet do not think we are to be like them, but actually they laid a foundation so that we are to do greater things...not because we are capable but because God is. He mentioned that the Church has been holding back things for itself, for its people, but what we should want is when people look at us, they think, "This is just not possible for them to do, so it must be God!" Wow! That is exactly where I want to be! Then the Lord had my attention. Some might say I went on a rabbit trail, but this was clearly from my Lord. He was revealing something sad and wonderful at the same time. I was thinking of the churches I had been in over the years and the things I have experienced. I was feeling sad for those who are not really sharing God, as if the miracles and gifts are only for themselves or the other people who go to their church. 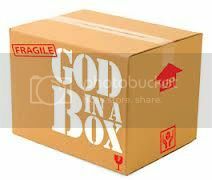 We love God so much and are so protective of Him that we place God in a box. Most of the people who do this think they do not. I can say this because I am as guilty of it as anyone. Why did I ever think God needs to be protected? Oh, I rationalized it that this Christianity thing is fragile and I might turn someone off about Jesus, but if I am listening to God, how can obeying Him do harm? He is God! Really, that is how little I have been thinking of Him...? I often hear something along the lines of it is not that we doubt God is all powerful, but that we doubt He will use His power. Everyone needs to see God's power at work and God is willing to provide evidence of His love, but how will that be done? God reveals His power and love through our weakness, through the things we cannot do but are willing to step out in faith to do anyway. But, what does God do when we do not? When we have Him in our little box? Well, that is sad, but the wonderful part is God will meet us at our faith level, because the reality it that it is not He who is in the box, but we ourselves. He is continually trying to show us we are free, that our faith is our freedom and is the stuff that works His miracles. We will not be the vessels through whom He will work miracles, if we do not act upon our faith in Him to do what we cannot do. As I was listening to the messages from the sermon and from my Lord, a man three rows in front of us caught my attention as he was shifting in his seat. He was a big man who had unabashedly praised God earlier. I did not know him, but it was obvious to me from his clothing and tats that this man was into Harley-Davidson motorcycles. The service ended and my husband was ready to leave, but I was feeling that tug from the Lord and told him I had something I was supposed to do. I waited a few minutes as the man was talking to friends and then I said that I had something to give him. He had already taken my hand in a handshake fashion. I said that I knew he was in pain. He asked me to tell him where. Now, some might see that as a test, but I see it as faith. If he did not have the faith that God would tell me where, he would not have asked. I told him in his back and legs, and that he also had other issues but these were bothering him the most today. Now that might have been obvious to anyone who was watching him sitting, but there was more to come. I asked him if he would like to be healed of it and he gave an enthusiastic yes. (Such faith!) As I prayed I also felt a great and deep sorrow. I told him that he also had this and that he does not share it, but hides it. He was smiling, as is his way to hide it, but he confirmed this with his eyes and a nod. I prayed that the Lord would guide him to the place so that he would be free of it as well. He had less pain and I told him it would continue to improve through the day. He hugged me a couple of times thanking me. He is the leader of a motorcycle ministry through the church, who had been injured in the lower back when he was a young man in the army and had been through five surgeries. God wanted to do a miracle for that man, but it would not have happened if I, who cannot heal of my own power, had not in obedience approached that man. That is my God out of the box. Where is God for you today?